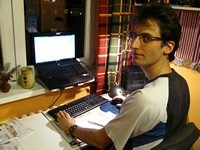 2002 First experiences with programming desktop applications, first simple version of ORO. 2005 ORO was used for online results from Europian Championships. 2007 Programming company Adamna NET established. 2008 ORO was used at two World Championships. 2011 Plenty of web pages and also some bigger programming projects have been programmed yet. 2012 Working as C# programmer at international research centre CEITEC. In 2007, I established a small programming company. At first we were creating customer solutions of web pages, then we continued with internet applications like an Intranet systems of companies, web services, etc. Now we are programming most sophisticated customer applications. Since 2012, I am working at partial load in Central European Institute of Technology (CEITEC) as a technical employee. My work is composed from programming drivers for specialized measuring devices and from robotic manipulators research.